2006-2009 Jeep SRT8, V-3 Si-Trim, Polished [4CK218-028L] : Supercharger Superstore, Your Online Source for Vortech Superchargers, Paxton Superchargers, Procharger Superchargers, Magnacharger Superchargers and Techco Superchargers! V-3 (self contained lubrication - no oil lines necessary) Si-Trim CCW rotation supercharger with an extended 6-rib belt and secondary cog drive. Welded charge air cooler core assembly with aluminum discharge tube, Bosch compressor bypass valve, silicone sleeves and stainless steel clamps. Compact water circulation pump for closed loop cooling. Hand-held programmer controls ignition timing and fuel enrichment. Fuel system upgrade includes larger fuel injectors and a 2 bar MAP sensor. These systems allow retention of all vehicle accessories. Installation time is 10-14 hours. Included with all superchargers except race/heavy-duty models. More information (PDF)	. Included with engine-oil-fed superchargers if purchased with a complete street-legal system. Not available with tuner kits. Available with V-3 systems for an additional $75.00. More information (PDF)	. 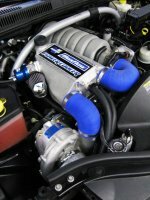 Available with complete street legal systems sold and installed by a Vortech Top-Tier Installer. Not available with tuner kits. More information	.